The Treaty Database of the People's Republic of China was launched on January 1 and is free for the public to access. The first six months after the launch will be trial runs and then the database will be put to official operation. The establishment of the treaty database is an important measure for the Ministry of Foreign Affairs to improve management of treaties, practice "diplomacy for the people", and serve the Belt and Road Initiative. The public can download treaty texts from the database, look up treaty information, and post related questions by phone and email. The Ministry of Foreign Affairs website has released relevant information in which the log-in portal is provided. We hope this database could be of service to you and look forward to your valuable comments. Q: In his New Year address, DPRK leader Kim Jong-un expressed his willingness to meet anytime with President Trump and reiterated his commitment to realizing denuclearization of the Peninsula. Kim Jong-un also sent a personal New Year letter to ROK President Moon Jae-in, saying that he would actively seek opportunities to visit the ROK. There are also reports that Kim Jong-un also sent Trump a letter about DPRK-US dialogues. What is China's comment on this? A: I have noticed relevant reports. Over the past year, the situation on the Korean Peninsula has undergone important and positive changes. The Peninsula issue has returned to the track of dialogues and negotiations, and inter-Korean relations have achieved comprehensive improvement and development. The Chinese side fully acknowledges the important measures taken by the DPRK towards the realization of the denuclearization of the Peninsula, supports the DPRK in holding onto its denuclearization stance and peaceful dialogues, supports the DPRK-US and DPRK-ROK efforts in sustaining their sound interactive momentum by demonstrating more goodwill to each other, consolidating mutual trust and continuously improving relations so as to promote the denuclearization of the Peninsula and the political settlement of the Peninsula issue. 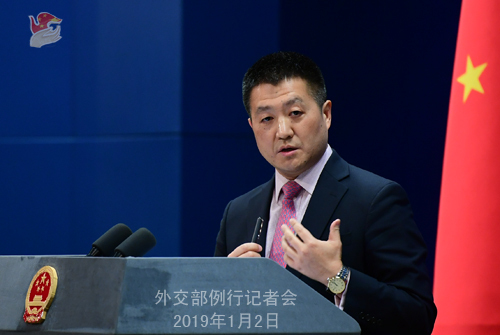 As President Xi Jinping pointed out on December 29 in his phone call with US President Trump at the latter's request, China encourages and supports the DPRK and the US in having more dialogues for positive outcomes. We hope that the DPRK and the US could respect and accommodate each other's legitimate concerns and make positive progress in promoting the denuclearization of the Korean Peninsula and the building of a peace mechanism on the Korean Peninsula in the new year. China will continue to play a part in this regard. Q: Can you confirm that China has offered to give Pakistan 2 billion dollars in aid to support its foreign currency reserves? A: China and Pakistan are all-weather strategic partners of cooperation. The Chinese side has offered and will continue to offer its best through assistance, trade, investment and all-around practical cooperation to support and boost Pakistan's economic and social development. Our two sides in fact have been in close communication with each other on the relevant cooperation. Q: Bangladesh's Election Commission said on December 31 that Prime Minister Sheikh Hasina's Awami League won the parliamentary election with a large majority. What is your comment? A: China, as a friendly neighbor to Bangladesh, has noted the smooth running of its 11th national parliamentary election. We congratulate the Awami League on winning the election under the leadership of Chairperson Hasina. We would like to work with the new Bangladeshi government to move forward China-Bangladesh strategic partnership of cooperation. Q: In President Xi Jinping's speech made at the 40th anniversary of issuing Message to Compatriots in Taiwan, he said that China makes no promise to renounce the use of force and reserves the option to take all necessary measures against the external forces which try to undermine the reunification process. What specifically do these external forces refer to? A: I am glad that you have followed President Xi Jinping's important speech this morning for the 40th anniversary of issuing Message to Compatriots in Taiwan which comprehensively reviews the breakthroughs and progress made by cross-Straits relations over seven decades since the founding of the PRC, especially since the implementation of the principle of peaceful reunification. President Xi Jinping expounded on China's major policies and propositions to move forward China's peaceful reunification for the great rejuvenation of the Chinese nation in the new era. I hope that you could have a comprehensive understanding of President Xi Jinping's speech. President Xi Jinping also made it very clear in his speech that adherence to the one-China principle is a consensus shared by the international community. The international community generally understands and supports the just cause of the Chinese people in opposing "Taiwan independence" separatist activities and realizing national reunification. President Xi Jinping made the message explicitly clear in his speech. We make no promise to renounce the use of force. This does not target compatriots in Taiwan, but the interference of external forces and the very small number of "Taiwan independence" separatists and their activities. In fact, you should note that China's stance on this has never changed. Q: According to Japanese government officials, the Chinese oceanographic research ship "Xiangyanghong 1" conducted seafloor detection in waters near Japan's "Okinotori Island" on December 18. The Japanese government believes that the relevant waters belong to Japan's Exclusive Economic Zone (EEZ). What is your comment? What is the purpose of this detection? A: According to the information I have, the Chinese oceanographic research ship "Xiangyanghong 1" recently conducted marine scientific and research activities in waters near Okinotori in accordance with the law. I want to stress that firstly, as a signatory to UNCLOS, China consistently observes the relevant provisions of UNCLOS in its marine scientific and research activities. Secondly, according to UNCLOS, Okinotori reef does not meet the basic requirements to be recognized as island. The Japanese side unilaterally calls it an island and claims the so-called EEZ and continental shelf, but the Chinese side has never acknowledged that. Q: The US "Asia Reassurance Initiative Act of 2018" was signed into law. The Act includes Taiwan-related contents that are not legally binding, like asking for stronger official exchanges and military ties between the US and Taiwan. What is your comment? 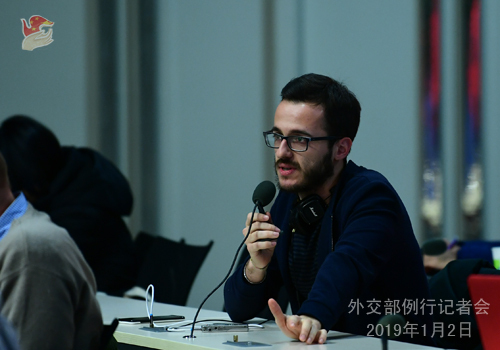 A: The above-mentioned Act seriously violates the one-China principle and the provisions of the three China-US joint communiques, and grossly interferes in China's internal affairs. The Chinese side expresses strong dissatisfaction with and resolute opposition to the US insisting on signing the Act into law and has already made stern representations with the US. I would like to remind the US side of the speech made by President Xi Jinping at the 40th anniversary of issuing Message to Compatriots in Taiwan. He stressed solemnly that the Taiwan question belongs to China's internal affairs, concerns China's core interests and the national bond of the Chinese people and allows no interference from the outside. We urge the US side to abide by the one-China principle and the provisions of the three China-US joint communiques. 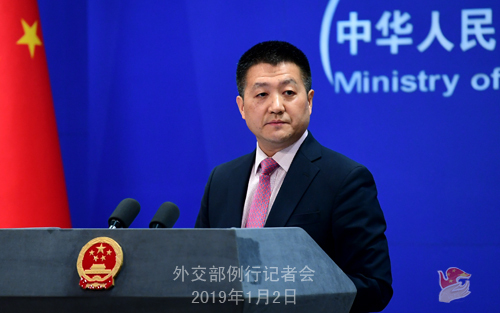 The US must not implement the relevant contents of the Act and should carefully handle the Taiwan-related issues in a cautious manner so as not to impair the overall situation of the China-US relations and cross-Straits peace and stability.